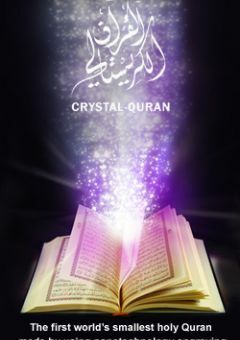 What is Crystal Quran® ? Yes it is the dream that came true ! 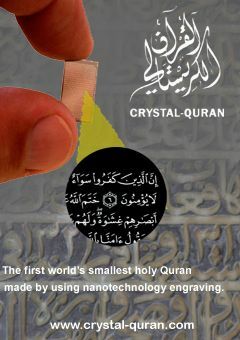 This is the first world’s smallest Quran on a Crystal. We have used Nano-technology to embed all the pages of the Quran on this crystal, the Holy Quran in its smallest dimension ever appeared. 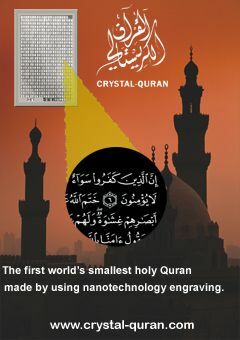 Crystal-Quran is the first original reproduction using the nanotechnologies (sub micronic spot writing), needed high precisions, complicated procedures and modern techniques which gave this valuable micro sized Holy Quran a high purity. The 114 original sacred texts of the Holy Quran, which consist of 611 pages, were reproduced authentically and totally, in each piece of this pure crystal. 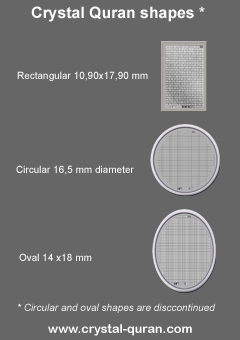 The tiny area engraved with the text is only 9,25mm x 15,40mm. 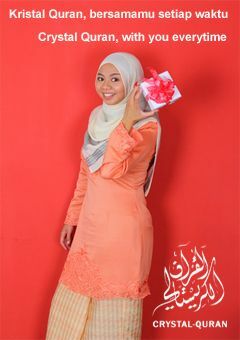 The holy Qur'an scriptures are protected by a special layer to avoid any unintentional touching. 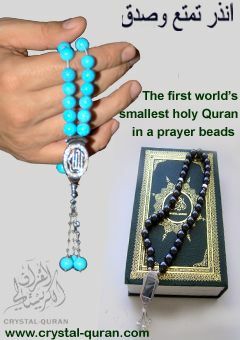 The Quran, which most Muslims believe is the precise words of God, has a lot of significance. It is a culmination of a series of celestial messages that enables a person to choose the right path in all phases of their life. 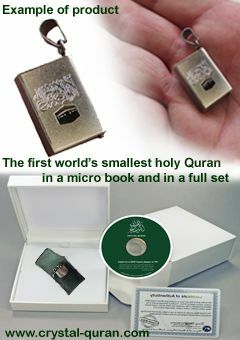 This microscopic Koran made using new technologies has been strictly adhered to the believers. Click on the rectangular crystal picture, each small area is the real page engraved, click on each smaller area page and the real text page engraved will appear in front of you. You can click on any part (case) of the picture, that will show you the text from each page inscripted on all the Crystal Quran surface. How do I know the whole Holy Quran is a conform error less and an original text ? 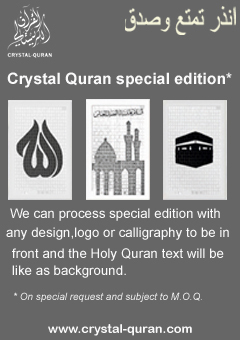 Crystal Quran for 2014 will be delivered with a new special viewer (“ Crystal Quran Viewer”) which is very easy to use and to see the pages with the text engraved. 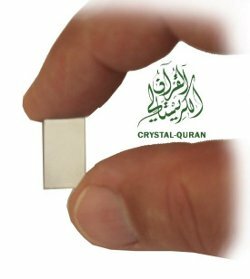 Crystal Quran is processed in rectangular shape (11x18mm) for the regular production and the production in oval (13x18mm) or circular shape (dia 16,5mm) are discontinued. We are working on a new edition of the Crystal Quran which will be around 30% smaller but with difficulties to read with our Crystal Quran viewer than the actual original Crystal Quran regular version . 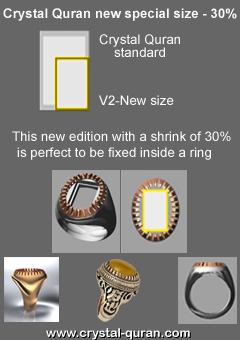 New size for the text will be only 6,475 x 10,770 mm. This new edition will be perfect for any ring item, as for an Quran Agate ring. If you want to be informed for the availability, please click here . On special request and according minimum quantity, we are able to produce any black & white designs, logo, calligraphies on the front. We can add any decor to be clearly visible to the naked eye, with the text as a graphic reverse polarity in the background. It is perfect for any officials, religious organization or fund raising actions. If you want to be informed for the availability, please click here . What is the Crystal Quran ?